Our dog, Rowdy, is not just a pet, he’s a family member. Keeping him healthy requires attention and care…and sometimes some money. That’s where our savings mind kicks in. Thanks to Mr. Chewy, Rowdy’s medicine for the next three months was bought on super savings. When I started browsing the Mr. Chewy site, my mind first went to buying some food, but when I stumbled upon the Frontline treatments, I knew exactly what I wanted to pick up. We were out of flea medicine, and the savings were too good to pass up. The site’s categories, brand listings, and suggestions based on “cat” or “dog” really helped steer my shopping. Should I have had questions, there even was a live chat that could be used. And can I mention unique? When I go back to my account on Mr. Chewy, I am greeted with a “Woof” instead of the standard “Login” or “Welcome” of other sites. Love it! 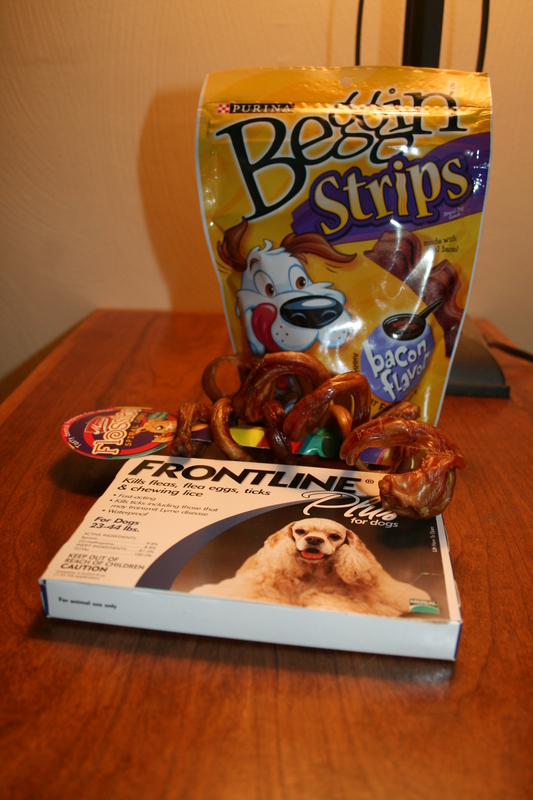 I placed an order for 3 months of Frontline and picked up a few treats for Rowdy (and some for your pet), then went to check out. Check out was straightforward. I was stunned when I selected my shipping options and realized 1) I had spent enough to get free shipping and 2) it would be at my house the day after next. You see, I placed my order late on a Monday evening, so I never imagined I would get the box in two days. Sure enough, it was waiting for me when I got home Wednesday! One other thing I love about Mr. Chewy is that they have a sweet referral program that give back. If you place an order at www.mrchewy.com and use my referral code BECK4218 at checkout, not only will you get 10% off your first order, but Mr. Chewy will donate $10 to an animal loving charity of my choice! (I chose the Best Friends Animal Society). I’d love for you to consider using Mr. Chewy for your next pet supply order. To entice you, I am also hosting a giveaway of a few extra treats I picked up plus a $25 worth of pet food coupons from Mr. Burgher’s stash. * If you win, you will be e-mailed and have 48 hours to respond with your mailing address so I can send your goodies out. * Mandatory Entry: Leave a comment on this post giving me your pet’s name and favorite treat. Like the site says, they have the brands we love, are cheaper than going to the store, and ship for free right to your house (if you order over $49). What’s not to love?!?! Good luck! 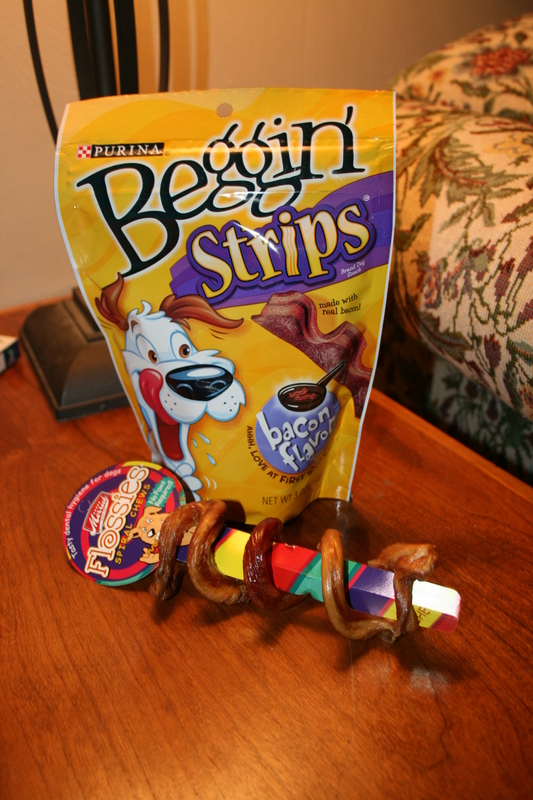 This entry was posted in Giveaways, Product Reviews, Rowdy and tagged giveaway, Mr. Chewy, pet treats. Bookmark the permalink. Amadeus – 10, loves food but goes nuts for regular old dog biscuits. He also really likes baby carrots. Alexander – 10, loves Kongs stuffed with anything and peanut butter. I swear he can hear me unscew the lid on the 64 ounce jar of PB. Pet’s name is Sidney and he likes milkbones. My dogs names are Shelby and Sasha and they like Greenies! Thank you so much for this wonderful review! We’re so glad that you and Rowdy enjoyed your experience with Mr. Chewy! We’re now open 24/7, so please feel free to call, chat or email us if you have any questions or need assistance. We’re always here and happy to help! Thanks again, and good luck to everyone who is entering the giveaway! My dog Dexter loves the Chicken Wrapped Sweet Potato treats. My dog is Murphy…he is a black lab mix I adopted on Halloween from our local shelter. He LOVES the Royal Canin dog food…as for treats…just about anything. LOL…but I would love to try their Blue Chicken Jerky since its made in the USA. my pets are baxter, paco, and amber bock. My 3 dogs.